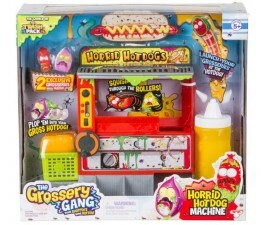 Sometimes we might just think that toys are just for kids, but if you are into collecting toys then Grossery Gang collectibles are for you! Also, it could be an excellent display for your kid's room as well. Since Grossery Gang is available in different lively colours that would capture their attention. Moreover, an excellent tool for teaching them colours. Assuring you high quality, odourless, and do not break easily. Collect them all now. Shop online now and enjoy our effortless shopping experience! Are you ready to meet the festering foodstuffs? Meet Grossery Gang! These toys can be played both for girls and boys. Toys are not just for entertaining but also will help kids to develop their fine motor skills. How about collecting them all today at Mr Toys! We deliver directly to your doorstep Australia Wide. Shop Online now!